Fumbling for their IDs at the entrance, first-time visitors to Northview Heights are often surprised when they see they must present identification to get onto the grounds. Once past the initial guard station, visitors are met with 200 security cameras turned on the neighborhood. Tall metal gates hold in the community on all sides. But it’s clearly not a prison, considering the rows upon rows of houses — some with doors wide open, neighbors chatting in front yards, and swaths of children in T-shirts throwing a football. This is Northview Heights — and within its fences is a living conglomeration of cultures and languages. It is also a Pittsburgh public housing project — one of six in the City. Other housing projects are located in Southside, Hazelwood, Homewood, the Northside and the Hill District. The City of Pittsburgh annexed Northview Heights, sitting alone atop a hill, in the early 1930s. Because of its geographic isolation, getting down to the City wasn’t easy, and trucks had to deliver groceries and other goods up to the neighborhood’s residents. And according to Valerie Lauw, Northview Heights resident and president of the neighborhood’s tenant council, that hasn’t changed much. Chuck Rohrer, spokesperson for the Housing Authority of the City of Pittsburgh, agreed. It’s “not close or in walking distance to much,” he said of the neighborhood. The neighborhood, once almost exclusively African-American, has become home to the influx of refugees and immigrants from diverse parts of the world who come to Pittsburgh for its affordable housing options and access to public transportation. A large portion are from African countries like Kenya and the Democratic Republic of the Congo, but the largest population comes from Somalia. For perspective, Northview Heights had a population of 1,587 in 2017. Of that number, roughly 385 are Somali Bantu — an ethnic minority group forced out during the Somali Civil War in the 1980s and 1990s. Many Bantus living in Northview Heights today came after spending several years in Kenyan refugee camps. Leslie Aizenman, director of refugee and immigrant services at Jewish and Community Services of Pittsburgh, said settling refugees in public housing immediately upon arrival isn’t common. Because they don’t arrive with any credit history or source of income, new arrivals go into private housing. Maintaining rent in a private housing situation quickly become unattainable once resettlement-agency assistance leaves, which is why so many wind up moving to Northview Heights — a neighborhood that can easily accommodate large families and families with disabilities. At Northview, residents pay one-third of their household income in rent. The neighborhood does boast some benefits to compensate for its isolation, such as having its own grocery store, gymnasium and health center. The North Side Christian Health Center has served underserved and uninsured people on the North Side since 2008. Cindy Loughman, executive director the health center, said it has had to adjust its services since large numbers of refugees and immigrants have moved to the neighborhood. The center has invested in telephonic translation services — a nationwide calling service that connects caregivers with translators during medical appointments. It’s not uncommon to walk along the neighborhood sidewalks and encounter residents in their traditional dress. One Northview Heights resident, Bint Amiri, stands against dreary, gray skies as she walks along the outside of the community center, draped in an intricately designed pink and blue dress covering her head to toe. For Amiri, Northview Heights is the latest destination in a series of moves. 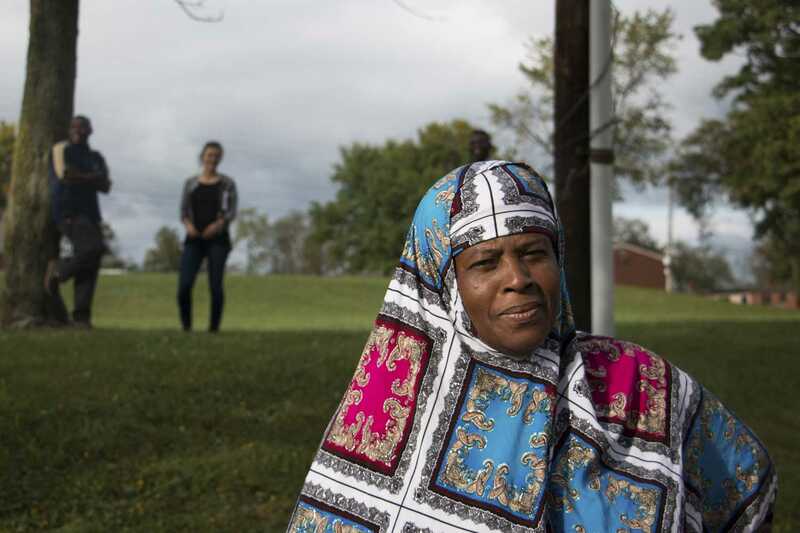 She travelled from her native Somalia to a resettlement in Pittsburgh, then to Louisville, Kentucky, and north to Erie before coming back to stay in Pittsburgh. “We came back because I have family here,” she said. Abdulkadir Chirambo, another Northview resident and leader of the United Somali Bantu of Greater Pittsburgh, is standing nearby and translated for Amiri. Though she’s lived in America for 20 years, Amiri does not speak English. Amiri speaks Somali, one of several dialects native to the Somali Bantu. The language barrier she experiences is an obstacle many other immigrants and Northview Heights residents experience, too. But the boundary lines for these communities often fall around those who share a language. The Somalis with the Somalis, the Congolese with the Congolese, the Americans with the Americans. “It’s the main thing [we] have to deal with,” Rohrer, from the housing authority, said of the barrier. And though Rohrer says they’ve done a good job addressing the language barrier by providing a staff translator to assist non-English-speaking residents, not all residents describe the environment in a positive light. Siraji Hassan, 22, another Northview Heights resident and Somali Bantu immigrant, paints a different, darker picture of a neighborhood divided — and the sometimes violent repercussions. But name-calling isn’t the only result of cultural differences in the neighborhood. Hassan walked over to the location of a recent incident between two residents on Chicago Street that turned violent when one shot the other. “It was the result of a cultural misunderstanding,” Hassan said. In an effort to promote safety, the community is monitored by security — but according to Lauw, security is not as present as it could be. She said there are many entrance points to the neighborhood that aren’t monitored by security, meaning people can just walk in. She also said patrol guards often appear afraid of the neighborhood they patrol. This is why, when the City of Pittsburgh announced it may soon replace private security with City police officers to regularly patrol both Northview Heights, Lauw was ecstatic. It could very well be a matter of life and death for Northview Residents — literally. Northview Heights is a neighborhood in motion. Its residents have seen brighter days and some darker ones too. But for Lauw, it’s all about making this neighborhood better every day for the ones growing up in it.